Pico Azores is the second largest of the Azores Islands. It is easily recognized because it has a large volcano that is the highest mountain in Portugal. It reaches an elevation of 2,351 meters. Aside from the majestic volcano that rises through the clouds (see some Photos here), Pico produces wines that are famous in Portugal. The base of the volcano is dotted with Vineyards. The wineries of Pico have been producing and exporting wines for hundreds of years. Pico was once heavily involved in hunting whales. Many towns have whaling factories in them. These are now museums to the old times when whaling was more acceptable. If you visit an old whaling town in Pico Azores you can see that it was once a much more "fair" hunt. The boats were tiny and the weapons were crude; when compared to modern day whaling. To learn more about this old way of life it is recommended that you visit the village of Sao Joao. There you will find a great museum devoted to whales and squid. Anyhow, whaling is no longer a part of Azorean life. Instead, the whales make for a great tourist attraction and Pico is one of the major departure points for Azores whale whatching. The old lookouts that were used to watch for whales to hunt are now used to spot whales so that tourists can be taken out by boat for a first hand look at them. Great care is taken not to interfere with the whales, but you do get close. Whale watching in the Azores is a magical experience. Another point of natural interest are the caves on the western side of the island. They formed as lava cooled after an eruption. They are filled with stalagmites and stalactites. Exploring with a guide is highly recommended if you decide to partake in this adventure. Aside from all of the natural highlights, that I have barely touched upon, Pico is rich in history. It's oldest town, Lajes do Pico, was inhabited as early as 1460. If you like beautiful scenery, have a sense of adventure, and appreciate "old world charm", I am sure you will enjoy a visit to the Island of Pico. Would you like to see some pictures? Pico Azores Photos has several great pictures. 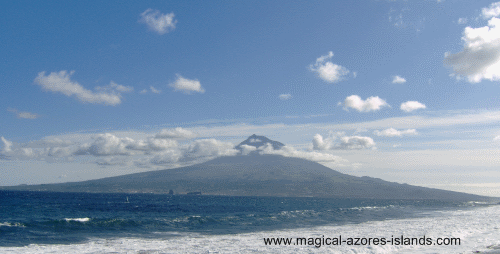 If you would like to know more about the Azores, please let me keep you up to date on that by subscribing my monthly Magical Azores Islands Newsletter (click here to go to subscription page).